Crematogaster (Decacrema) non-wax runners prune neighboring vegetation more intensely than their congeners inhabiting waxy Macaranga hosts . 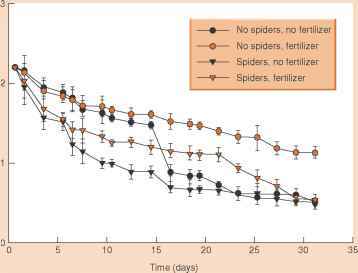 Stronger pruning not only more effectively prevents host plants from being overgrown by climbers, but also provides a better protection against invasions by foreign ants [29,34]. The greater intensity of pruning behavior might reflect a generally higher level of aggressiveness by Crematogaster (Decacrema) non-wax runners . Moreover, ants from the nonwaxy M. trachyphylla were reported to be more aggressive than ants from the waxy M. beccariana . Data from young Macaranga trees (1.80 to 3.00 m tall) indicated that colonies of non-wax runners have a higher number of workers per twig length , which probably result in a greater defensive capability. However, a different pattern was found in mature Macaranga trees , suggesting that other factors (e.g., food supply) contribute to interspecific variation of colony density.